Rochester, NY — Down & Out Books once again presents the new voice in crime/noir fiction with the release of Frank De Blase’s second book for the imprint, Busted Valentines and Other Dark Delights. With his first novel, Pine Box for a Pin-Up, De Blase introduced the world to Frankie Valentine: a likeable wise-cracking pin-up/crime scene photographer who gets mixed up in a series of murders. Valentine is reluctantly forced into solving the caper—set in 1950s Rochester, New York—in order to keep himself out of jail or the morgue. De Blase is currently hard at work banging out the sequel to Pine Box for a Pin-Up but Down & Out Books wanted to give a little something to the fans of his dark prose to hold them over. In Busted Valentines and Other Dark Delights, De Blase’s obliterated, alliterated, hipster jive and story twists seem all the more poignant in the short story format, where consequences are more immediate and cruel. The book introduces a cast of duplicitous, low-down characters who readers love to read about but don’t want to be…or be around. Who wants one of these degenerates staring back at them in a dark alley or the mirror: a musician who takes a wrong turn on the path to salvation, a hit man with a nice streak, a novelist who creates his own deadly reality, a deluded hotel clerk bent on vengeance, a poor sap who gets what he really wants for Christmas, a stripper with angles rivaled only by her curves, and others including two new Frankie Valentine stories. Each of these characters move in and out of the shadows of a noir-ish hell, which De Blase dishes out with a dash of humor. Perhaps the reader’s nervous laughter makes his tales more palatable; perhaps it makes the author a darker character yet. Frank De Blase is an award-winning writer, photographer, ex-rockabilly crooner, social contrarian, and all-around troublemaker who always leaves room for desert. His writing and photography has been published in LEG SHOW, LEG WORLD, SWANK, ULTRA, TEMPTRESS, RETRO LOVELY TABOO, OL’ SKOOL RODZ, CAR KULTURE DELUXE, REBEL INK, SKIN AND INK, URBAN INK, V MAGAZINE, DOWNBEAT, and CITY NEWSPAPER. De Blase lives in Rochester, New York with his wife, Deborah. 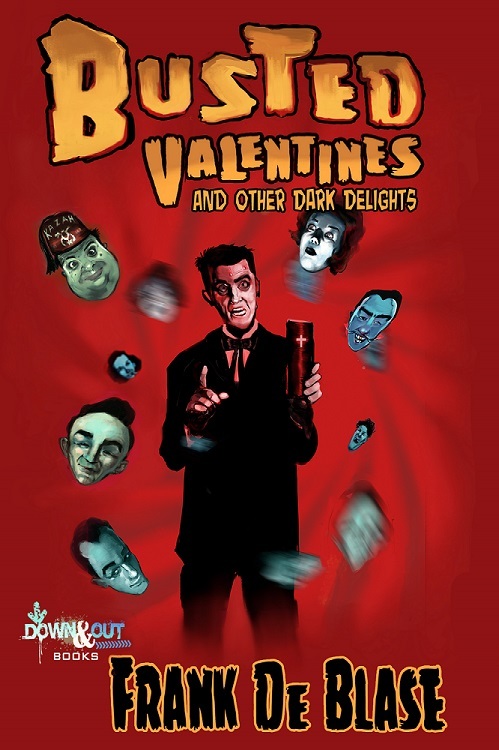 Busted Valentines and Other Dark Delights is available as a trade paperback and all eBook platforms.